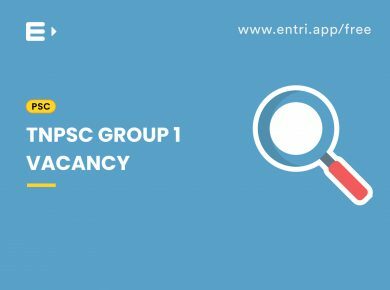 Tamil Nadu PSC has invited applications from graduates to fill the most prestigious group 1 services. Candidates can apply on or before January 31, 2019 through the online application portal. As per the given notifications, preliminary examination is scheduled for March 2019, while date of Main examination is yet to be published. Oral Test in the form of an Interview. The Preliminary examination is scheduled for 3 hrs, for 300 marks. SCs, SC(A)s, STs, MBCs/ DCs, BC(OBCM)s and BCMs should score minimum 90 marks for becoming eligible for the mains and for others they have to score 120 marks out of 300 to appear on the mains. For both Preliminary and Main Examinations, the questions on General Studies will be set in both Tamil and English. Mains Examination will be of descriptive nature for a total of 750 marks and the interview / oral test is for 100 marks. Mains examination consist of three papers, each for 250 marks and for 3 hrs. The admit card for eligible candidates will be made available in the Commission’s Website http:// www.tnpsc.gov.in or http:// www.tnpscexams.net or http:// www.tnpscexams.in for downloading . Admit cards will not be sent by post, so the applicants should check the TNPSC website before the scheduled date of examination.